Vale Canada Limited operates one of the largest integrated mining facilities in the world here, mining and processing ores containing nickel, copper and other metals. The company’s Sudbury, Ont. mining complex has been in operation for over 100 years. Starting in 2012, the Sudbury plant undertook a billion-dollar Clean Atmospheric Emissions Reduction (AER) project to reduce sulfur dioxide stack emissions by 85 per cent. Previously, Vale refined both nickel and copper in Sudbury, says Tom Zanetti, senior project manager on the Clean AER Project. After analyzing the total life of the mines and the long-term projections of mine capacity in the region, the company decided to focus on nickel production and sell copper concentrate to other companies instead of refining it in-house. Vale worked with Ionic Engineering of Lively, Ont. to design a material handling system capable of packaging 27 to 35 tons/h (24 to 32 metric tons/h) of the copper concentrate into bulk bags by integrating a Flexicon automated bulk bag filling system into its existing process. 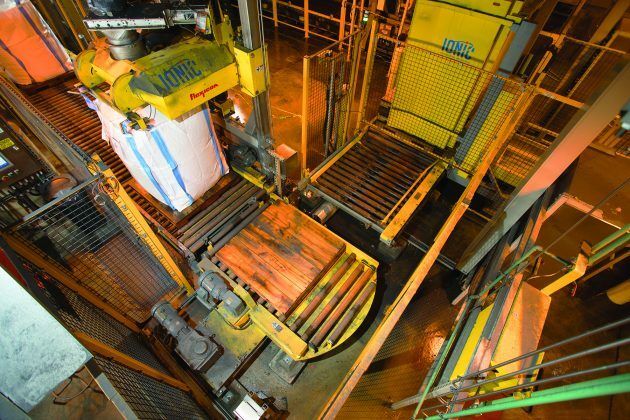 To handle the volume, Francois Nzotungwanimana, operations manager at Ionic Engineering and project engineer on the bulk bagging project, specified the dual bulk bag fillers, roller conveyors and a central pallet dispenser comprising the Flexicon system. In addition, Ionic designed the electrical and control systems, sourced labeling machines and other equipment, designed safety systems and performed the systems integration including programming, electrical and safety. The Ionic Engineering team also performed additional mechanical design and safety engineering. The ore mined on site is first ground into a flour-like powder, says Zanetti. A flotation process removes waste rock. The resulting bulk concentrate is sent to a smelter, which produces a high-grade material containing both nickel and copper. Another flotation process separates the nickel and copper concentrates. Vale refines the nickel concentrate into metal on site. The copper concentrate, after de-watering and drying, has a texture similar to that of sand and contains 60 to 70 per cent copper. It is conveyed to two large feed hoppers positioned above the dual bulk bag filling stations, each hopper holding 11 tons (10 metric tons), enough to fill five bulk bags. Flexicon’s Project Engineering Division integrated a pallet dispenser, pallet turntables, two 25 ft (7.5 m) long roller conveyors, and two Swing-Down bulk bag fillers. The pallet dispenser is positioned between—and at a right angle to—the mirror-image bag filling lines. A forklift loads 10 to 14 pallets at a time onto the pallet dispenser. When one of the bulk bag fillers calls for a pallet, the dispenser lifts all except the bottom pallet, which is sent to the left or right filler by the powered roller conveyor. A turntable then rotates the pallet 90 degrees to align it with the filler. Once a pallet is in place, the filler’s Swing-Down fill head lowers and pivots from horizontal orientation to vertical, positioning the discharge chute and bag strap hooks within reach of an operator standing on the plant floor. This furthers the plant’s safety initiatives by eliminating the need to step on roller conveyors or strain to reach overhead connection points. 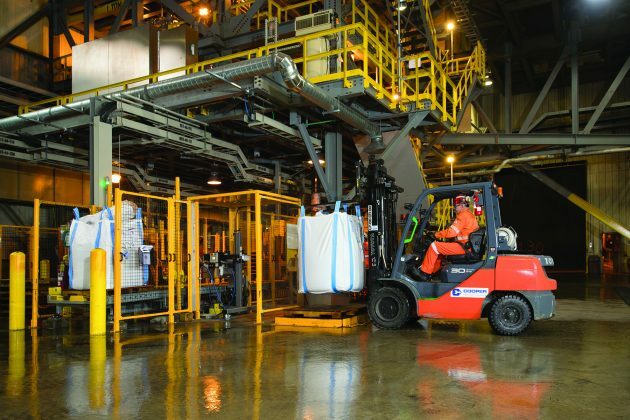 A forklift transfers the filled bags to a storage area, ready for shipment to customers. In addition to fitting into the limited space available, the dual bulk bag filler configuration provides capacity, flexibility, and redundancy for the bag filling process. Automatic pallet dispensing reduces wait time and the likelihood of worker injury. Ionic Engineering designs and builds automation systems for mining, metals processing, and other industries. Besides this bulk bag filling system, Ionic has completed several other projects under the Clean AER initiative.